I did originally sort by colour alone. But after some proper building I've begun the process of sorting by piece, but I'm keeping the rarer, specialist colours separate. I haven't got much dark red so it's going be easier to look at that I decide if I can use that colour in my build. Still trying to find cheap storage options though. But I have found the boxes washing tablets come in good. There are some pretty amazingly organized storage setups shown in this thread! Other than that, many of the larger collections of parts/colors are in bigger bins that have always been sort of "fit in" wherever there's space in my setup at that moment, along with many other pieces in random boxes (even some old set boxes like the old Yellow Castle and some old space sets)! Don't know if/when I'll be able to do that again. FYI - I still prefer the Iris towers, but Sterilite drawer towers/carts are not a horrible substitute for the Iris drawers if you're on a tight budget. My suggestion would be to take a look at Wal-Mart during back-to-school season when they go on sale for around $9 a pop. You can still merge towers and some do come with casters (though if you stack as many drawers as I do, don't go rolling 'em around on carpet...the plastic around the holes for mounting the caster pegs into is not quite as sturdy as the Iris ones). One thing they do trump the Iris drawers on is that you can slide them out completely without disassembling the drawer frames...makes for much easier reorganization and mobile sorting. I'm curious, it seems that sorting by color makes sense for larger bricks unless you (a) have a large supply of containers available (for different piece types) and (b) you don't mind switching between multiple containers for every different piece as you build. I tend to keep all my basic bricks sorted by color and my smaller bricks sorted by type and I add detail later with the smaller bricks (if possible). I might also sort the lesser-used larger pieces, like large plates, sorted by function. Either way, I try to avoid having a ton of containers sitting around just to build the basic shape of my model. You guys bring up some very good points and suggestions... i will use them this weekend when i start sorting. Since my topic has been locked and this topic hasn't necessarily answered the questions that I want answered or advice on, I will ask my questions under this topic. I have 9 bins of Lego that I want to sort through. Within the bins are sets that are partially built. I can specifically see that some of these sets go to Star Wars, Batman, Indiana Jones, etc. My goal is to build these sets that I know are partially built and build as many sets as possible. As an example, at the moment I'm trying to build the Geonosian Fighter (4478). I have found parts to this set throughout a few of the bins. - Has anyone tried to sort through multiple bins knowing that parts to a specific set are spread out through the multiple bins? - If you were in my position and trying to achieve my goal of making complete sets, would you just separate and sort every piece before trying to build the sets? 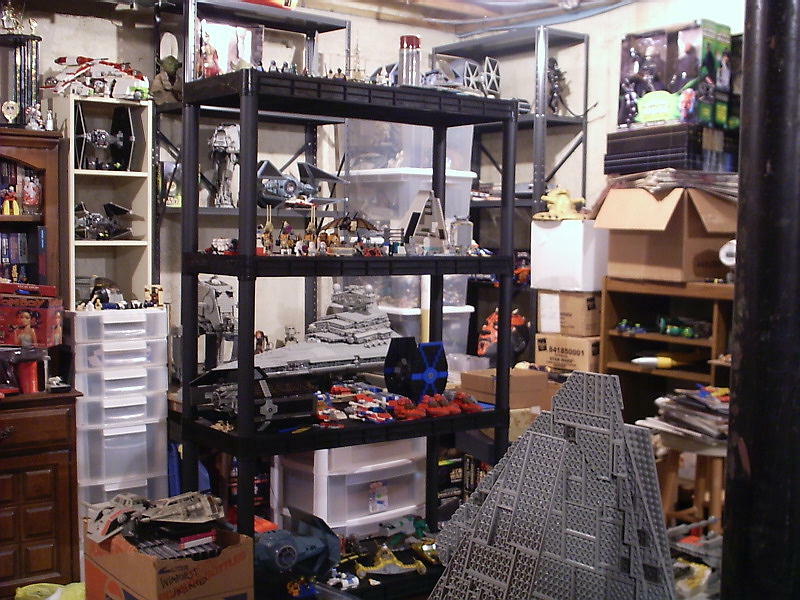 - Or would you just try to build the sets while sifting through the different bins? I appreciate any feedback that will lead to me achieving my goal. J30spiff wrote: - Has anyone tried to sort through multiple bins knowing that parts to a specific set are spread out through the multiple bins? When I got all my childhood sets when my parents moved across the country I was in a similar situation. Lot's of different Castle, Town, Pirate and Classic Space sets that had been apart for years and mixed throughout several bins by years worth of younger cousins playing with them. The first set I built was Black Falcon's Fortress without any sorting at all. A relatively small set that took me a few hours to build because I was digging through the bins for each piece. After that I sorted all the pieces by type into smaller shoebox sized plastic bins. All each had their own bin. How much you sort will really depend on how many sets there are. If it's only a couple sets, I'd probably just have a few bins, one for plates, one for bricks and one for other parts. The rest of the Castles and Forestmen stuff were all built about the same amount of time it would have taken if I had just opened the new boxes. Some day I'll try to figure out exactly what Classic space and Town I have but without the instructions I haven't been very motivated to do it. Sorting by part type seems to be much faster to me for assembling sets than sorting by color since most sets only have a couple of colors, but your mileage may vary. J30spiff wrote: Since my topic has been locked and this topic hasn't necessarily answered the questions that I want answered or advice on, I will ask my questions under this topic. Whenever I sort a large lot of Lego to build into sets later, I first go through and separate all of the bricks and plates from one another to make sure I am only dealing with individual pieces. Then I go back through and do a rough sort into various categories, such as "1x" width bricks, "2x" width bricks, "1x" width plates, "2x" width plates, etc. Then, I go back through and sort those either into individual sizes and colors or into similar parts (i.e., all antennas together), and then build back up from there. I have found this system to be the most efficient on the back end process of assembling all of the specific parts needed for a given set. It takes a fair amount of time on the front end to get everything sorted, but it saves me from having to dig through bins to find that one little piece that I'm looking for. If this is a one time project and you're not looking to spend a lot of money on sorting gear, one of the easiest things to use are plastic food containers that you can buy at the grocery or discount clubs like Sams. They are cheap, come in various sizes, and are very useful for sorting. I think sort then build would be easier... because one you sort your pieces you will know where the pieces are located. I really don't want to sort through thousands pieces of Lego but it looks like that's going to be the most efficient thing to do. Sort through all the bins and then build what I can from there. Here's a pic of what I'm getting into. J30spiff wrote: I really don't want to sort through thousands pieces of Lego but it looks like that's going to be the most efficient thing to do. Sort through all the bins and then build what I can from there. Here's a pic of what I'm getting into. That looks like way more trouble than it is worth. Go ahead and ship them all to me and I'll dispose of them for you. Honestly, I think sorting is way overrated. Maybe it's just the lazy in me, but I never sort anything. A few years ago, I wanted to inventory all my sets from when I was a kid. It was probably 2/3's of what you have there, but I used the "build-to-sort" method. It was mostly classic space (lots of blue, gray and white), some mid 80's Technic (some yellow, red and blue technic bricks) and late 70's basic sets (red, blue, yellow and white bricks). I cleared off 2 large desks in my home office and dumped out batches of bricks to build the sets that had colors that stood out the most first, like the yellow on a Technic bulldozer and worked my way back. It took me 2 or 3 weekends, but I'd say it worked out pretty good. You could start with some of the brown, then maybe the white and so on. If the sorting doesn't work, then you should do what Fubar says and unload that mess. Boy, there sure is a lot of belly-aching here that's borderline trolling. "Oh, poor me, I have all this LEGO and now I have to BUILD IT!" Clearly you lead a tough life, son. I really feel sorry for you. What's that? You wanted helpful advice instead of snarky cynicism? Really? Don't you know? THIS! IS! FUBTUB! Now bear in mind, this advice comes from a person who once took apart most of his SW LEGO, mixed all the parts together, then sorted them out again and rebuilt the sets because he finds that kind of thing enjoyable. So yeah, I'd recommend doing something akin to what pacific 493 mentioned: sort generally and build as you go. The toughest pieces to spot are always little 1xX or 2xX plates and slopes, so sort those things first, searching for the part you need as you go. In other words, as you're building a set, you'll see you need a slope or plate and you can't find it, so you sort out slopes or plates until you find it, then move on to the next piece. You'll slowly build sets while organizing the parts and making it easier to build future sets. I think UOldPirate's point of building the sets with more obvious colors/pieces is sound as well, as that'll likely mean less sorting as you go because you'll find the parts you need faster. Bass Pro Shops has an in-store sale this Sunday Mar. 13 only for their 360 and 370 Utility boxes. They will be 4 for $10 with a limit of 12. That is only $2.50 per box plus tax. These are great for sorting and storing small parts. Also Walmart has various sizes and bundles of Sterlite storage boxes marked down from $5 to $2.50 a bundle. I managed to sort about 1/3 of my black pieces, 1/2 of my white pieces, and 9/10 of my greys (all greys) out, but I always end up re-mixing. The hours put in sorting helped a lot, though, because after doing it, I abandoned old grey for Bley and have never looked back. I have a carpet, and I build on it. It's a good Yoga experience, but someday I'll organize into drawers. My question is, I guess- How many drawers do people need to sort pieces by function? How many did it take your collection? Big or small, most of us probably have similar lots of pieces. mdilthey wrote: My question is, I guess- How many drawers do people need to sort pieces by function? How many did it take your collection? Big or small, most of us probably have similar lots of pieces. I would argue that folks with smaller collections would be more likely to stratify less and have single drawers that house multiple categories of parts (e.g. 1 drawer for modified brick vs. a drawer for log brick and a drawer for clip brick and a drawer for brick with grill, etc.). As your collection grows, you get more drawers and stratify more. For those that have sorted their collections piece by piece, how long did it take you? E.g. 45 hours for 10,000 pieces, etc. obi-wan jimboski wrote: For those that have sorted their collections piece by piece, how long did it take you? E.g. 45 hours for 10,000 pieces, etc. Never clocked in/out while sorting, but I'd say somewhere between "countless" and "unfathomable." Draykov wrote: Never clocked in/out while sorting, but I'd say somewhere between "countless" and "unfathomable." As someone who is considering moving from a set-sorted system to a part-sorted system, this is not encouraging! Let's see, I came out of my dark ages in 2005, so I'd say that I've been just about done for 6 years now. 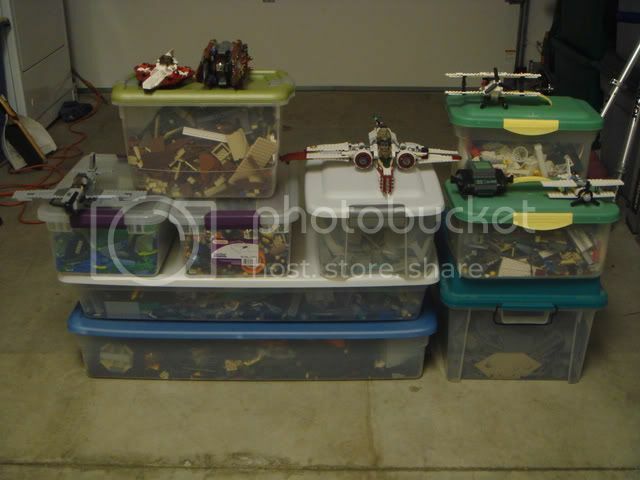 At any given time, I have probably 5-10k unsorted pieces, and semi-sorted bins make up most of my collection. They will never be truly sorted entirely, but it's sometimes fun to try.